The accumulated figure for the first eleven months of 2004 registered 4.3% growth, more than double the figure for the previous year. 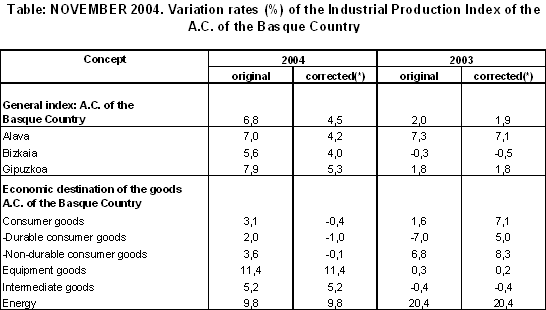 In November 2004 industrial production in the A.C. of the Basque Country grew 6.8% as an inter-annual rate, according to EUSTAT data. The balance for the first eleven months closed with accumulated growth that came to 4.3% (1.9% in the year 2003). If we take into account the effect of the calendar, the inter-annual variation in homogenous terms was 4.5% in November 2004 and the accumulated rate for the year was 3.8% (2.0% in 2003). In November 2004 the most positive inter-annual variations, in absolute terms, corresponded to the sectors of "Electric energy, gas and water" (15.6%), "Transport material" (13.6%), "Leather and footwear industry" (10.1%) and the “Chemicals industry” (9.8%); on the other hand, the most negative inter-annual rates corresponded to the sectors of "Metal and non-metal minerals" (-14.0%), "Non-metal industry" (-10.0%) and "Textiles and clothing” (-8.7%), among others. Over the whole of the first eleven months of the year in relation to the same period in 2003, the highest growth rates corresponded to “Electric energy, gas and water" (20.2%), "Oil refining" (9.0%), "Transport material" (7.1%), "Electric material" (7.0%) and "Machinery" (6.3%). Negative rates mainly affected the sectors of "Leather and footwear industry” (-13.4%), "Metal and non-metal minerals" (-12.5%), "Non-metal industry" (-11.0%) and "Other manufactured" (-7.1%), among others. 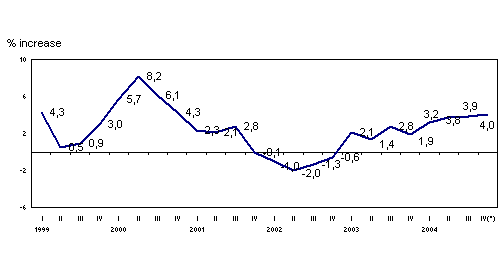 According to the classification of goods according to economic destination, in November 2004 inter-annual rates increased for Capital Goods (11.4%), Energy (9.8%), Intermediate Goods (5.2%) and Consumer Goods (3.1%), due to the increase experienced by Non-Durable Consumer Goods (3.6%) and Durable Consumer Goods (2.0%). Over the whole of the first eleven months of the year, Energy accumulated 16.9% growth in absolute terms, Capital Goods reached 5.4% and Intermediate Goods also rose by 2.8%, while Consumer Goods decreased as a whole by 0.2%, divided between Durable and Non Durable with -2.9% and 1.1%, respectively. By province, the inter-annual evolution of the General Index followed differing trends, rising in absolute terms by 7.9% in Gipuzkoa, 7.0% in Alava and 5.6 % in Bizkaia. Over the whole of the eleven months in 2004 the highest accumulated growth rates corresponded to Alava with 8.1%, the second position is occupied by Bizkaia with 3.6% and finally Gipuzkoa obtained a slightly lower 3.0% increase.